There aren’t many clubs in Portugal with SC Braga’s charisma. The Arsenalistas are a historic club in Portuguese football, founded in 1921, a few years later they adopted a red and white kit, similar to the one English giants Arsenal still use today. Braga’s history is full of ups and downs with several campaigns in the second tier of Portuguese football. However, things started to change in 1975 when the club returned to the Portuguese top flight for good, not being relegated since. In 1966, the club won their first major domestic trophy – the Portuguese Cup – after defeating Vitoria FC in the final. Last season, Braga won the second greatest domestic trophy in their history, the Portuguese League Cup, after a long fast that had lasted more than 45 years. During the 1980s and the 1990s, Braga always had quality players, but for one reason or another they always failed to seriously challenge. But in the next decade, that all changed. In 2003, a new chapter in Braga’s history started to be written. That year, their current president Antonio Salvador took over the helm of the club and implemented a new mentality at the Portuguese team. The entrepreneur wanted to transform the Arsenalistas into a top team in the Portuguese league system, capable of battling against the three historic giants FC Porto, SL Benfica and Sporting CP. Under his leadership, Braga won the UEFA Intertoto Cup in 2008, finished second in the Portuguese Primeira Division in the following year and grabbed two consecutive places in the UEFA Champions League. In 2011, the club reached the UEFA Europa League final, but were defeated by Andre Villas-Boas’ unstoppable Porto. Last season, however, Braga’s campaign was somewhat disappointing. Despite winning the Portuguese League Cup, defeating Porto in the final, the club left something to be desired as far as the other competitions go. They failed to reach the Portuguese Cup final and ended fourth in the Primeira Division, thus failing to secure a place in the Champions League. Last season’s poor campaign also meant the end of the line for their former manager Jose Peseiro, who was sacked by the club’s president and accused of a lack of ambition. The former Real Madrid assistant manager arrived at the Minho city and created a fuss among the fans, but that initial excitement slowly started to fade away throughout the season. This season Salvador wanted to start from scratch and he began an internal revolution at the club. 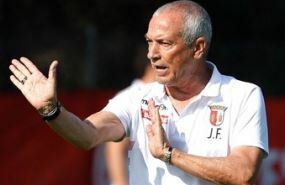 He brought in a new manager, the experienced and charismatic Portuguese coach Jesualdo Ferreira and he sold several players, allowing the new manager to build a team of his own. Several of the players that were sold were accused by Salvador of suffering from lack of commitment and professionalism, something that catapulted the team’s president to the front pages of the Portuguese sports newspapers. The supporters were, and still are, considering this season as a crucial turning point for their team and have put their trust in Ferreira. Braga had a quality pre-season, putting in some classy performances. However despite the good season start with two consecutive wins over Pacos de Ferreira and Belenenses, the team then had a week to forget, being surprisingly eliminated from the Europa League at their own stadium by Romanian side CS Pandurii. If that wasn’t enough, in the same week they were defeated at Barcelos by Gil Vicente in a Primeira Division clash. The ghosts of another inconsistent season have started to hover over Braga’s supporters once again, but the club have nevertheless claimed third place in the league at the time of writing. Braga have an impressive looking team this season with several international Portuguese players, all of whom boast plenty of quality and experience; but will that be enough to battle against Porto, Benfica and Sporting for the Portuguese league title? Will Salvador accept yet another underachieving season this year? Ferreira has a mammoth task ahead of him, but he has enough experience and quality to deal with this type of pressure.